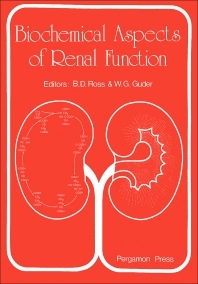 Biochemical Aspects of Renal Function is a collection of papers from the Fifth International Symposium on the Biochemical Aspects of Renal Function. The materials presented details the advancement in the understanding of various areas in the biochemistry of renal function. The title first covers the metabolic studies in kidney, and then proceeds to tackling intermediary metabolism and its regulation. Next, the selection discusses the biochemistry of filtration and reabsorption. The last chapter covers renal work and ATP. The book will be of great interest to students, researchers, and practitioners of medicine, biochemistry, and physiological sciences. Inhibitor of Renal Gluconeogenesis (IGN): Additional Physiological Modulator? Discussion of Paper "The Glomerular Permeability for Water and Albumin in the Isolated Perfused Rat Kidney"